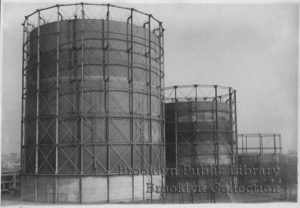 Part of an ongoing, irregular series of historical articles called True Crime: Bay Ridge. Captain Aumack saw the body, floating in the water. It was around 8 a.m. on Thursday, November 2, 1899, and he was out on his oyster sloop in Raritan Bay, a mile and a half off the coast of Keyport, New Jersey—and about 12 miles southwest of Fort Hamilton. Aumack “ordered the boat to be brought alongside” the floater, the New-York Daily Tribune reported. The crew drew the body into the boat with boathooks, and when it reached the deck they were amazed at seeing a rope tied about the waist, attached to which was a stone weighing perhaps thirty pounds. The skull was also found to be crushed in and the face badly bruised. Around the neck was a purple mark, indicating that the man had either been strangled or the body had been towed through the water after having been thrown overboard. 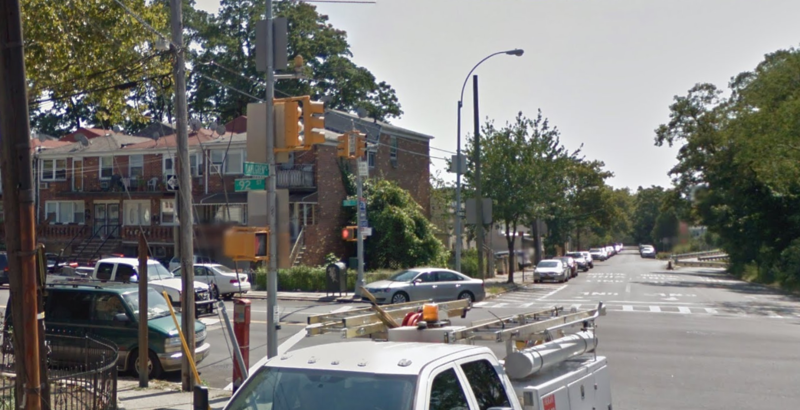 Though it wouldn’t have been immediately apparent—a Southern body, found in New Jersey—this murder mystery would be traced back to the dark, forested roads of Bay Ridge, and before it was solved—or was it?—decades would pass. And the killer would strike twice more. 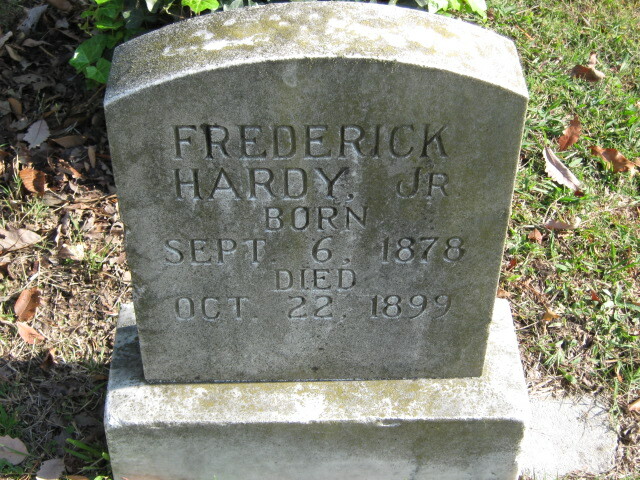 An autopsy concluded that Hardy had been murdered, by a blow to the head. The likely motive was robbery, as he may have had as much as $40 on him (likely worth about $1,100 in today’s dollars), as well as a unique cigarette case, made of gun metal, almost the color of a rifle barrel, and an unusual watch, all of which were missing. The watch had belonged to Hardy’s grandfather, Henry C. Hardy, a banker who lived at 111 Montague Street. “It was made in England,” the Asbury Park Daily Press reported, “and was of guinea gold. It was a combination watch of peculiar make, as manipulation of a spring would remove the outer cover, and from a case watch the piece would be transformed into an open face one. The case was worn thin, and Mr. [Henry] Hardy doubted if there was another watch in this part of the country like it.” The newspapers believed that if it were discovered—say,brought to any pawnbroker or jeweler—it could crack open the case. What did turn up were cards and receipts belonging to the young Hardy. Miss Annie George lived at her late father Henry’s house, on Shore Road and 99th Street, which roughly 30 years later would be demolished and replaced by apartments. (Mr. George had died suddenly, in 1897, at the peak of a momentum-gathering mayoral campaign; his friend and neighbor Tom L. Johnson’s house later became Fontbonne.) A photo from 1931 shows a dignified, three-story colonial home with a handsome colonnaded porch. 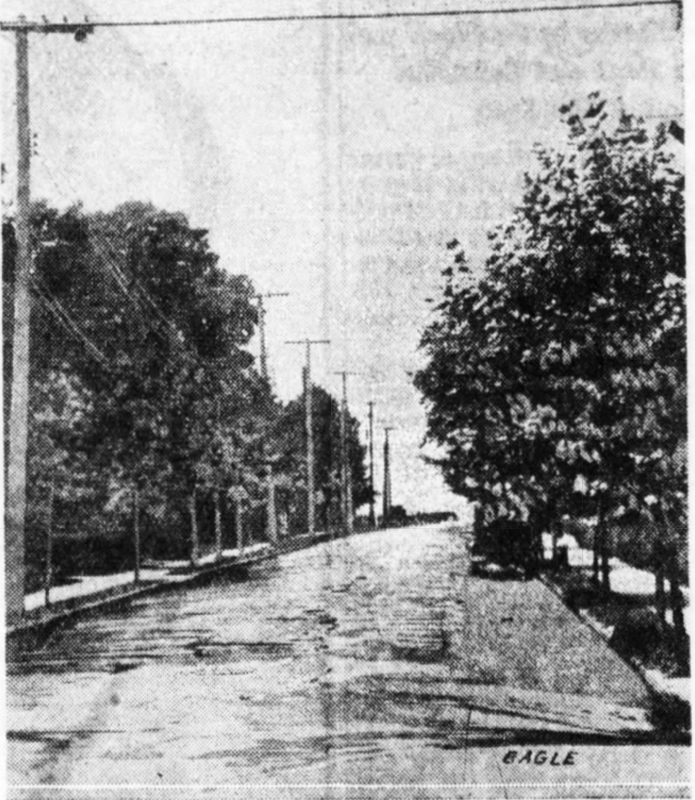 Across the street from it, Annie discovered (along with her search party, which included a Miss Bruckner and a Thomas Hoskins), “seven cards, five engraved with the name of young Hardy, lying scattered about the ground on a steep declivity leading from the Shore Road down to the water’s edge directly opposite the home of Albert Johnson, the street car magnate, at Ninety-ninth Street and the Shore Road,” the New York Times reported. When a reporter called at [George’s] house hoping to find some one who had heard cries along the lonesome road she guided him to the spot where the cards had been noticed. On the water side of the Shore Road opposite Mr. Johnson’s house there is an opening in the railing left for a gate, but to which no gate is swung. From this opening steps lead down the declivity twenty feet, whence a zigzag pathway leads southerly to Mr. Johnson’s boathouse. From the foot of the stairs the path sheers almost straight down to the water’s edge. The hillside is covered with trees and bushes, and is a desolate place. At the gateway at the top of the declivity lying just inside the rail from the street a card with young Hardy’s name on it was found. Lying just within the rail on the other side of the gateway and within a few feet of the street was found the bloody card bearing the young man’s name. It was crumpled. Six fingers marks were outlined on the face, across which was a spatter of blood. Down ten of the wooden steps was picked up a Pullman sleeping car receipt for passage from Tennessee to New York. Hardy had moved north to attend the Art Students’ League, a still-functioning school near Carnegie Hall; he was scheduled to begin classes on Monday, October 23—the day before he disappeared. (A man at the school told me it doesn’t appear to have records that go back that far.) 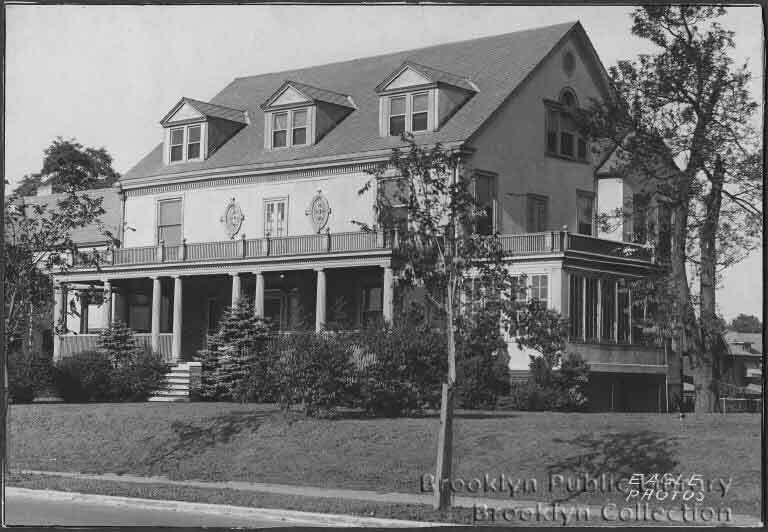 Hardy had chosen the Fort Hamilton neighborhood because T. Coleman Ward, his inseparable “chum” from college, in Nashville, was living there with his aunt, Mrs. E. C. Moxham, on 96th Street, between Shore Road and Marine Avenue. 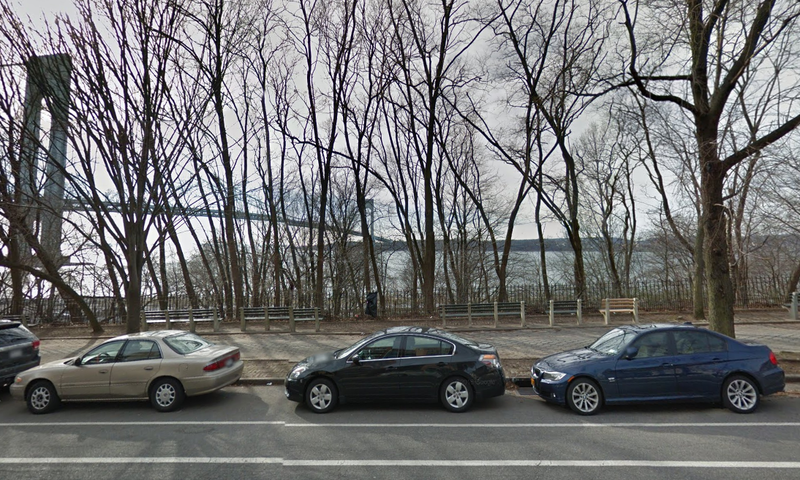 Hardy had found a room in a boarding house nearby, on Shore Road and 95th Street. He spent his last day living it up, Fort Hamilton style. 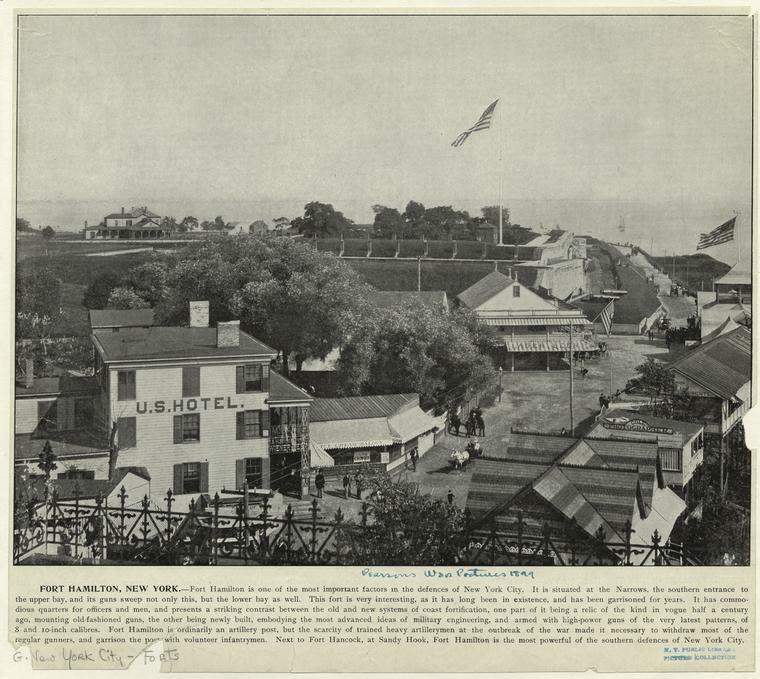 “The young men engaged themselves in various ways, bowling, cycling, boating, and fishing, and Hardy became known by sight to many of the residents of Fort Hamilton,” the Times reported. Another report suggests he did a bit of bawdying. In the afternoon, he bought three packs of cigarettes at McNickles Pharmacy, on Fourth Avenue, from a Dr. Flynn. Later, he visited the Bismarck Hotel, the Martin House and the Dewey Hotel. “He stayed a short time in each place and, it is said, was seen to drink several glasses of beer,” the New York Journal and Advertiser reported. There was a rumor he may have been with a woman, but a review of the Dewey Hotel registry found no handwriting that resembled Hardy’s. 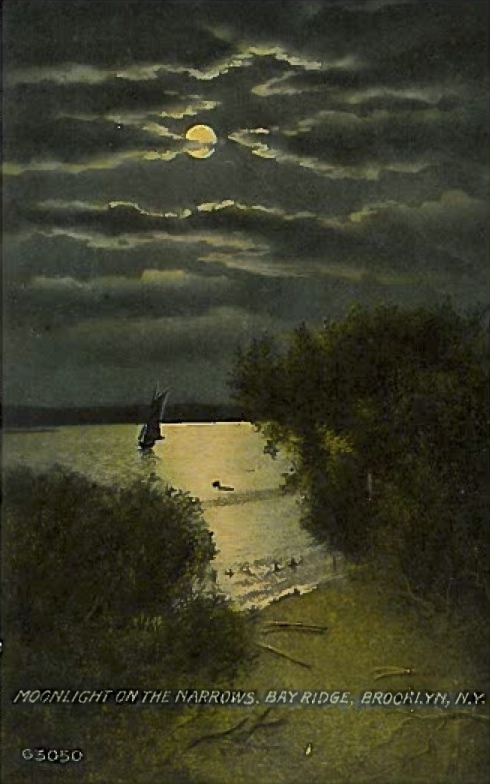 The boys were back at the Moxham house that evening, with some other young people; Hardy remained until about 11:15 p.m. “His manner was much as usual, and he talked of his ambition in art, sang, and played, and seemed in the happiest of moods.” When he left, a young man “gave [Hardy] his card, and invited him to call,” the Times reported. “Hardy took the card and put it in his vest pocket. He was accompanied to the door by his friend Ward and bidden good night. 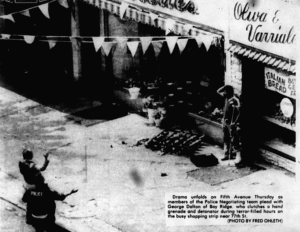 The only problem was, “The man who owns and tends the store tells the Eagle reporter that Hardy did not come there on the night that he disappeared. Of this the shopkeeper is positive. He says that he knew Hardy from having often seen him with Ward, and he says that he kept his store open that night until nearly if not a little after midnight. Then these killers would have emptied his pockets and carried him down to the Hegeman boathouse, just south of the Johnson boathouse reached by the stairs at Shore Road near 99th Street, where the cards and receipts had been discovered. Hegeman had 21 boats for rent that season and no nightwatchman; several used stone anchors like the one tied to Hardy, and one was missing. The killers must have rowed him out to sea from here, then dumped him and rowed back, storing the stolen boat as not to arouse suspicion. Then they would have fled. Frederick Hardy, Sr., promptly came north from Tennessee when he heard his son was missing. “He has been scouring New York and vicinity, but could not even find a clue,” the Asbury Park Daily Press reported—that is, until he read an item in a New York paper about the “ghastly find” in New Jersey. He took the early train to Keyport with his father, Frederick’s grandfather. “At Undertaker Beele’s place he asked to see the body,” the Chicago Tribune reported. “It is my son,” said the father, shaking with grief and horror at the marks of the terrible end of his son. The father, as he stood by the mangled body and saw with what a ferocious cruelty life had been crushed out, announced a determination to have vengeance. That evening, Hardy’s body was sent to Norfolk, to be buried in the family plot there. It arrived in the morning via the New York, Philadelphia and Norfolk Railroad, accompanied by his father and grandparents. (His mother and sister had helped Hardy install himself at the house on 95th Street before sailing to Europe, which is where they were when he disappeared and when his body was found.) 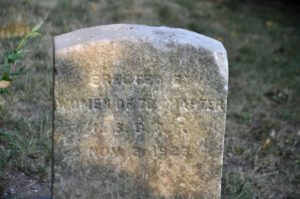 The funeral was held at the grave, in Elmwood Cemetery, where it remains today, marked by a plainly engraved stone. Because the handrail of the stairs that led down to the boathouses was broken, many surmised that this was where Hardy had struggled for his life; and because it was where the cards had been discovered, many believed it was the scene of the murder. One of the tramps was a tall, slender man who wore a reddish-brown checked suit. He left the others, and, going to a point on the shore where it is believed the crime was committed, spent some time in searching apparently for something. The informant thought that the man may have been trying to make sure that no clue had been left that would aid in the detection of the murderer or murderers. Such anonymous, possibly scapegoated tramps weren’t the only suspects. A sailor named John T. Martin was arrested on November 5 and released the next day for a lack of evidence; he admitted to being on a launch with a friend that landed that night at Hegeman’s boathouse but said they were only there to enjoy a few hours’ carousing. 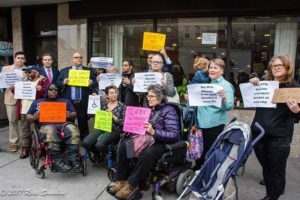 “Martin was indignant at his arrest,” the Times reported. Another man, a former gunner at the armybase who’d lived in the village for years, knew the area, the boathouse and where needed supplies, such as ropes and anchors, would have been kept. “He may be innocent,” the Journal and Advertiser reported, “but there is a strong chain of circumstantial evidence against him.” There’s no indication he was ever arrested. Then there was the vague reporting in the Eagle and Times about an old, unsolved crime in another state that strongly resembled the Hardy case, and that police had determined the same man was behind both and were now in pursuit of him. They don’t seem ever to have caught him. The Hardy case, once so closely followed that no news was news, disappeared from the newspaper record for the next two years—until Martin Bennett died. The wealthy local resident had seen “strange men” at the dock that Hardy’s killers would have left from on the night he died. Bennett told friends he had more information that could lead to the killers’ capture, the Eagle reported. It appears that the death of Mr. Bennett was caused by apoplexy, brought on by an animated discussion between a strange man and himself. The stranger appeared on the Bennett premises and he and Mr. Bennett had been heard to use harsh words. The stranger disappeared a few moments later, but not before he had informed the next door neighbors that Mr. Bennett had been taken suddenly ill and needed assistance. It is expected that should the stranger be located he might be able to throw some light on the Hardy mystery. But, like every other lead, nothing came from this one, either. The case remained cold. Until two more people were killed. In 1906, John Kelly worked as a driver at the Crescent Athletic Club, a prominent Brooklyn institution whose summer grounds were where Fort Hamilton High School is today. He was 45, and he lived with his 24-year-old wife, Mary, and their two young children, Annie and Mabel, in two furnished rooms in a two-story frame boarding house on Dahlgren Place, near 92nd Street. 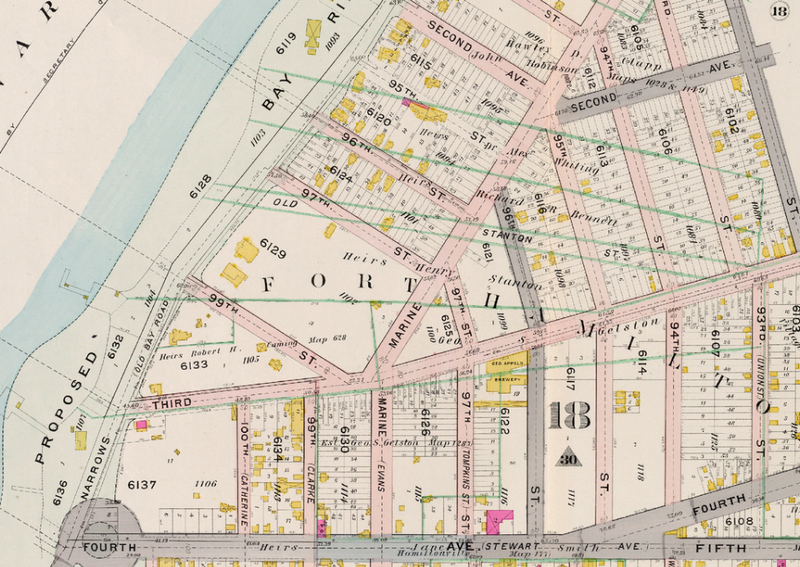 It was supposed to be temporary; Kelly had recently been evicted from his home in “Irishtown,” a nickname for parts of Fort Hamilton Village, and moved to his friend John Keller (and his wife Sadie)’s boarding house in the woodsy Goose Hill section, the area “behind” the armybase, from about Fort Hamilton Parkway to Seventh Avenue, as far north as 86th Street. This antagonism climaxed on Tuesday, June 5, 1906. The Keller boarders often got together in the evening, as they had this night. “Drinking was indulged in freely,” the Eagle reported, “and before morning the party became rather boisterous and disorderly.” Mary Kelly and John Kilbride were present, but John Kelly was not—he had another engagement. That left the two paramours alone to talk (and possibly to do other things? ), which they did for much of the night. Then John Kelly came home, preceded by the sound of his footsteps. “Here comes your husband!” someone shouted. Mary begged her lover to hide. The Eagle says he refused, but the more colorful account in the Times says he obliged. It is not very clear what Kelly started to do. Before he could say or do anything Kilbride had jumped from his hiding place and was between Kelly and his wife. Kilbride said…that Kelly had jumped at his throat. By the looks of his face and throat he did. Kilbride, however, had a revolver in his hand. He fired three shots, according to the police. One of them hit Kelly in the heart, another, a stray shot, hit Mrs. Kelly in the chest, and still another went wild. A soldier from Fort Hamilton was the first to reach the house after the shooting. He notified the police, and told them when he got into the place those in the house were going right on drinking their beer, although the body of Kelly lay on the floor, and Mrs. Kelly, mortally wounded, was lying on a bed in her room. Annie, 5, and Mabel, 2, were sent to the Children’s Society. Kilbride had run out the back door, and he was not arrested until morning. (Reports vary as to whether he gave himself up after spending the night in Coney Island or was captured near the village by detectives.) Mrs. Kelly was taken by ambulance to Norwegian Hospital, on 43rd and Fourth, and lived a few days, until she succumbed to her injury on June 10. The following day Kilbride faced a second charge of homicide. And the day after that, a grand jury indicted him for murder in the first degree; realizing he could get the electric chair, Kilbride agreed that same day to plead guilty to murder in the second degree, and he was sentenced to twenty-to-life in Sing Sing. It turns out he’d made it only 25 feet. The warden ordered an intensive search of the shops, believing Kilbride couldn’t have escaped the prison grounds. (Just a month earlier, an inmate had hidden in the clothing shop for almost a week.) The guard in the packing house poked every shaft several times; eventually, a tin cup rolled out of one. “Soon after that his probe encountered something soft, and then there were wails from a man inside,” the Times reported. “Kilbride must have lost his hold as the result of the jabbing, for he shot out of the shaft to the floor like a weight. According to the police, ‘Gilbride’ says that his conscience bothers him and he wants to ‘clear off the books’ the mystery of the murder of Hardy. 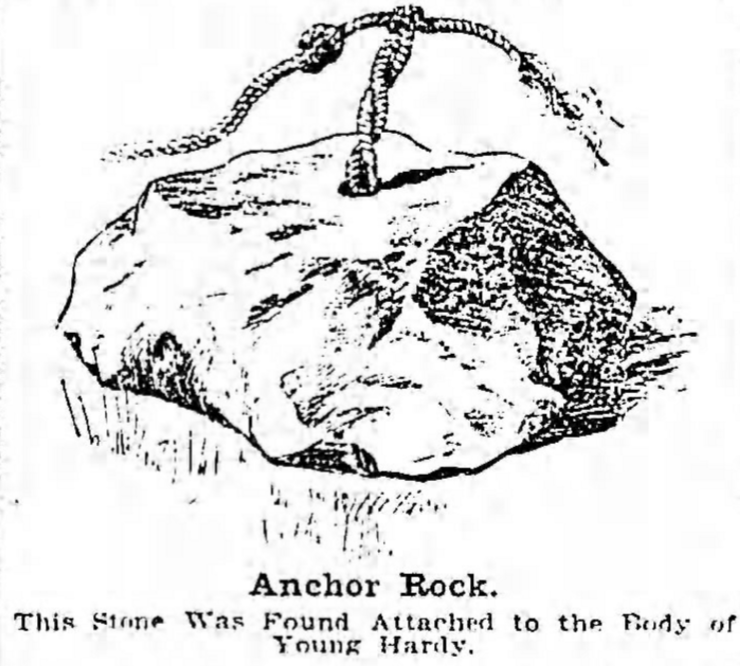 The writer goes on to state that he was down financially and seeing Hardy display a roll of bills he followed him, struck him with an ax and after robbing him threw the body in the bay, weighting it down with a stone. Gilbride/Kilbride would have been about 18 at the time of Hardy’s murder. There’s no suggestion that police had considered him a suspect at the time. And there’s not much more mention of this letter in the press, at least that I could find—whether police took it seriously enough to officially close the Hardy case, or even whether it was confirmed to have been written by Kilbride. 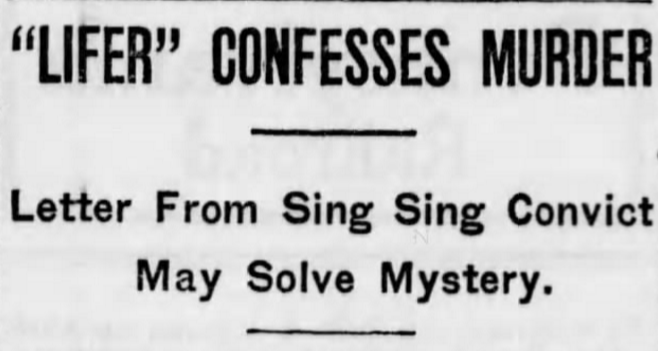 (The New York Sun and Madrid Herald at least, unlike the Times, mention the confession in their accounts of Kilbride’s Sing Sing nonescape.) Maybe he really killed Hardy; the letter strikes me as too weirdly specific and random to have been a hoax—but maybe that’s why the last name was misspelled? Or, an imaginative mind could conjure reasons for him to have lied: perhaps suddenly renewed pressure on the police to close the case was displaced onto Kilbride, who agreed to cop to the murder in exchange for some reward, such as better treatment in jail? He was in for life, anyway—or so he thought. Apparently no one took this letter seriously enough to file it with the parole board! 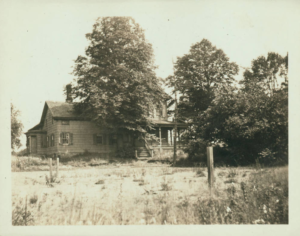 Ten years later, on June 24, 1923, John Kilbride walked out of Sing Sing, on parole after serving just 17 years for a double homicide, three short of his minimum sentence, even though he had attempted to escape and confessed to a third murder. The Eagle reported, in a tiny item near the bottom of page 20A, that he was “in joyous mood” as he left—and then he disappeared into history, along with his victims.